Traditions are timeless; our customs are not. What is an American? This question might not even make sense. Rarely do we argue about any fundamental qualities that define Americans, because there are so few. This article was featured in the 2017 Freshman Issue. Sophomore summer has reminded me that Dartmouth is in fact a unique place. Six months into the Trump administration and The Donald has little to show for himself. Signature campaign promises such as the Definitely-Not-Muslim Travel Ban and “The Wall” have been bogged down in courts or have yet to even begin materializing respectively. 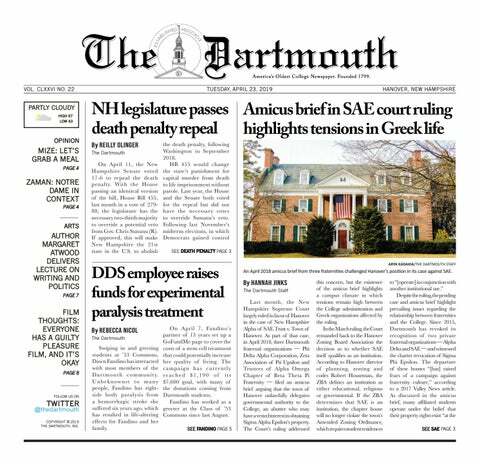 Article 9 is a wake-up call for Dartmouth. Students must act together. Our experiences of this place start with each other. Generation Z faces unprecedented challenges as it comes of age. The College’s administration lacks any real vision for the College. Our civilians and military have never been more divided — but we still need respect.